Gold futures drew muted action Thursday morning, tipping slightly higher a day after markets in the U.S. were closed in observance of the Fourth of July holiday. August gold GCQ8, +0.24% edged up 60 cents, or less than 0.1%, at $1,254.10 an ounce. That follows a 1% Tuesday rebound that helped the yellow metal claw back some losses that drove futures to the lowest levels of 2018. For the week, bullion prices are little changed. The most popular fund tracking gold, the SPDR Gold Shares GLD, +1.01% meanwhile, also was about flat this week, according to FactSet data. Thursday’s action comes as the Dow Jones Industrial Average DJIA, -0.54% and the S&P 500 index SPX, -0.49% as well as Europe’s Stoxx Europe 600 IndexSXXP, +0.77% were climbing or poised to advance. Equities usually trade inversely to haven gold, with stock benchmarks rising even as a Chinese official warned earlier Thursday that planned U.S. tariffs on Chinese products—a portion of which is set to take effect in less than 24 hours—could potentially ripple throughout the globe. “The U.S. is firing shots to the world, including to itself,” said Gao Feng, a spokesman for China’s Commerce Ministry. Worries about a spat between the two largest economies, China and the U.S., have rattled investors, and weighed on both equities and gold, the latter of which ordinarily would benefit from the uncertainty fostered by the dispute over global trade imbalances. However, concerns about fraying relationships between the U.S. and its longstanding trade partners in the European Union, North American and China, has helped strengthen the dollar and weighed on commodities priced in the monetary unit, including bullion. The ICE U.S. Dollar Index DXY, -0.35% has gained 4.3% over the past three months, and 2.4% so far this year. However, the gauge, which measures the buck against a half-dozen currencies, was down about 0.4% early Thursday. A stronger dollar makes assets pegged to the currency more expensive to buyers using other monetary units. Accordingly, a weaker greenback tends to have the opposite effect. 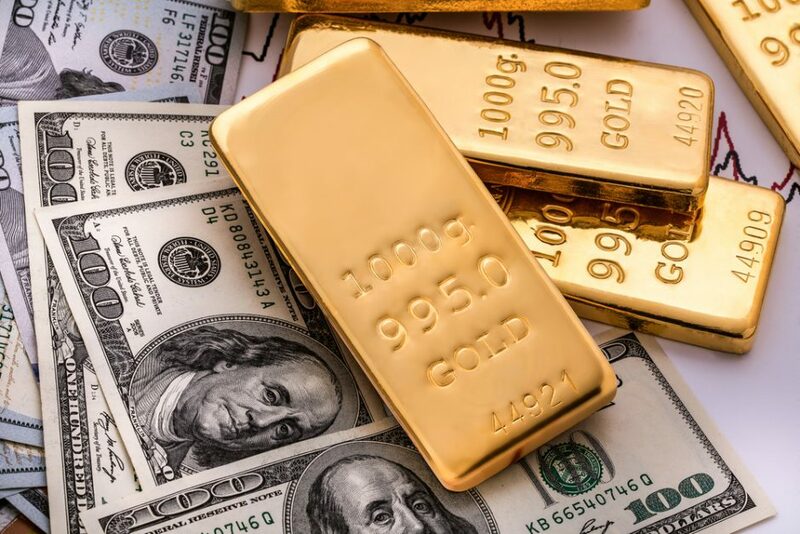 “Gold bulls have found support in the form of a weakening dollar this morning with prices rebounding towards a fresh weekly high at $1,260,” wrote Lukman Otunuga, research analyst at FXTM, in a Thursday note. Gold demand also has been hurt by the fear that a trade spat may hurt Beijing’s economy, which already has shown signs of decelerating in recent months. China is one of the world’s biggest buyers in metals including gold. “While the yellow metal has scope to appreciate further amid a softening dollar, the outlook remains bearish in the medium to longer term. This year, gold is still at risk to losing more value on the outlook that the dollar could strengthen further,” Otunuga wrote. Meanwhile, September silver SIU8, +0.36% slipped 4 cents, or 0.2%, at $16.005 an ounce. Gold’s sister metal marked the lowest finish since mid-December on Monday. Silver is set to shed 1.2% for the week. The most popular exchange-traded fund that tracks silver, the iShares Silver Trust SLV, +0.53% is down 0.8% so far this week.